Drug gangs controlled by Eastern European criminals are fuelling the rising tide of violent crime in London, a Labour MP has claimed. 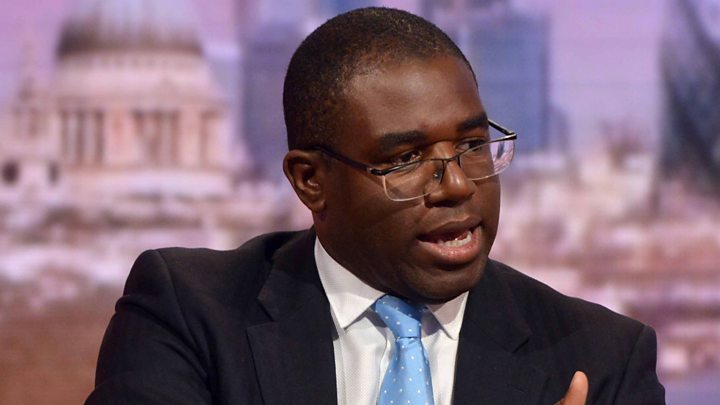 Tottenham MP David Lammy said drugs were as "prolific as ordering a pizza", comparing the situation to McMafia, a BBC drama about Russian gangsters. The MP said political leaders were doing nothing about it. The Metropolitan Police is now investigating more than 50 suspected murders this year. Police patrols have been stepped up and officers are using stop-and-search powers to seize weapons after the increase in violence. The government says it is "taking action to restrict access to offensive weapons", with consultations about new weapons laws, including banning online stores from delivering knives to homes. But Mr Lammy said violent crime in his part of London, where there have been four murders, was the worst he had seen in 18 years as an MP. Reality Check: Is UK the 'drugs market of Europe'? He told BBC Radio 4's Today programme there was "no single cause" for it but "turf wars" between drug gangs was a major factor. "What drives the gangs and the turf wars is an £11bn cocaine drugs market," he said. "We are the drugs market of Europe and I'm hearing nothing about what we're going to do about that rising drugs market. "Drugs are prolific. It's like Deliveroo. They're as prolific as ordering a pizza. You can get them on Snapchat, WhatsApp. That in the end is driving the turf war and it's driving the culture of violence." He added: "I think the police and our country has lost control of that drugs market." Asked who he thought was behind it, he said: "I do know from the police that there are big gangs - Eastern European, Albanian - they traffic people, they traffic drugs and they traffic guns." He said the police and Border Force did not have the resources they needed to tackle the gangs - but the issue was being ignored by politicians and not being debated in Parliament. He also pointed the finger at Labour's London Mayor Sadiq Khan, and Home Secretary Amber Rudd, who he suggested were not taking the issue seriously enough. "I have not had a phone call from the home secretary, I have not had a phone call from the mayor, no one has come to visit my constituency. This is happening across London at large. "Frankly, I am sick of the political football. What I want is a political consensus." He added: "There is a McMafia out there that needs to be tackled." In a BBC London interview, Sadiq Khan denied suggestions he had not shown enough leadership this week: "I have been around, speaking to my team, I've been in contact with the [Metropolitan Police] commissioner." "We are doing what we can, working around the clock to make sure we grapple with this issue." He said he was "working closely with the Met Police" on a "number of initiatives" including youth facilities and services. He said he did not accept Mr Lammy's claim that the police had "lost control" of crime in London: "What I do accept is there is a crime issue across the country. There's been an increase since 2014. "It's a national problem… You can't cut 40% from the Met Police, 46% from youth provisions in London and not expect to see consequences." Mr Khan said he had asked for a meeting with Prime Minister Theresa May about the issue six weeks ago but so far, had not secured one. Reality Check: Has London's murder rate overtaken New York's?